RajiWorld is proud to invite you to a double bill of two clients playing together for the first time! 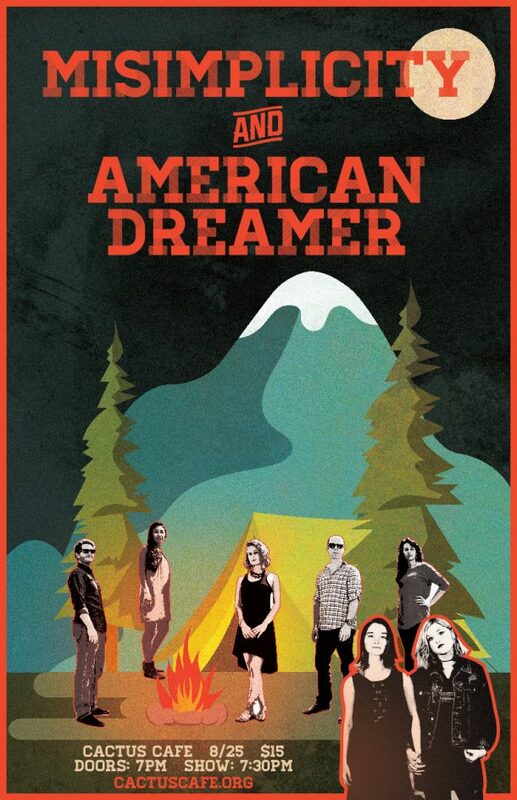 American Dreamer: Comprised of three classical musicians and two former rockers, Austin orchestral folk ensemble American Dreamer has over 30 years of collective music school experience. Members can be found performing with the Austin Symphony Orchestra and teaching at the University of Texas at Austin. Not surprisingly, the band’s sound mirrors the generosity apropos of educators. In performance they selflessly let each other share the spotlight as much as they commingle in it, obviously in appreciation for what they do as individuals and as a group. From the rocker “Start-Stopping” to the more introspective “Apollo,” American Dreamer’s songs flow easily with intricate, lush harmonies and expressive instrumentation reminiscent of October Project. With one foot in classical music and the other comfortably in folk, the common thread that runs through every song and each member of the group is the natural urge to share sounds, emotions and stories through music. In the last year, American Dreamer has performed at the Kerrville Music Festival (Kerrville, TX), Old Settler’s Music Festival (Driftwood, TX), Mayfest (Ft. Worth, TX) Deep Ellum Arts Festival (Dallas, TX), Texas Folklife Festival (San Antonio, TX) Heart of Texas Rockfest (Austin, TX), Ultimate Louisiana Party (Dripping Springs, TX). Misimplicity: Misimplicity is a collaboration between singer-songwriter/multi-instrumentalist Grace London and bassist Zoe Cz, two 16 year old musicians hailing from Austin, Texas. Elements of alternative-folk, indie-rock, and 90’s emo fuse together on the duos first self-titled EP, a six song reflection on the difficulty of existing comfortably as expressed through Grace London’s uniquely poetic stream of consciousness writing style. The album is a testament to the enormity of introspective thought in all its strange loops, a dissection of the wishes and regrets we hold on to; feverishly communicated and beautifully performed.